Europe is a hive of cultural attractions, but if it’s history you’re particularly interested in, then there are some destinations that really stand out. Of course, in terms of individual attractions there are enough to write about to fill a library, so today we’re going to focus on the top attractions of three of the continent’s most exciting historical cities. Before we get started, though, it’s worth pointing out that you don’t always need to take several holidays to see the highlights of several places. 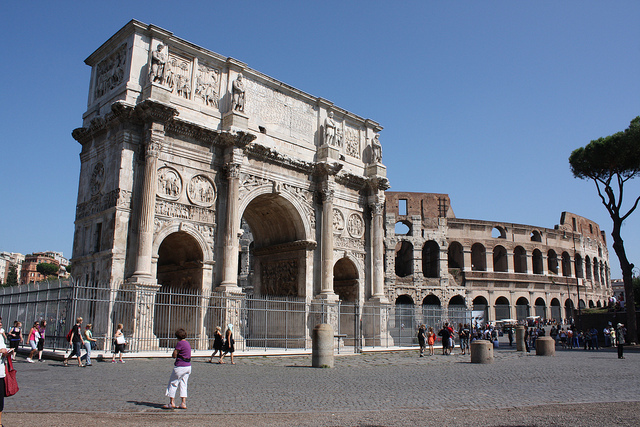 In fact, if you are particularly interested in Europe’s history and want to explore a number of destinations in a single trip, then you ought to book a cruise, since you can find itineraries that include great combinations for history lovers, like Messina, Rome and Athens. The gateway to Sicily, Messina is a port city that has welcomed a diverse array of people to its shores over the years, with Greeks, Romans, Arabs and Byzantines being just a few of those who landed here and helped shape the local culture. Like many of Europe’s most dazzling historical cities, Messina’s past can be discerned in amongst the modern constructions. One of the most important historical buildings, for instance, is the Duomo of Messina, which was built in the 12th century by Roger II of Sicily. While this building is very historic, it’s only the lower part that’s been preserved as it once was – you see, the cathedral was actually destroyed by an earthquake in 1783, and then again by bombings in 1943, meaning it has been rebuilt several times. While you’re here, look out for Fontana di Orione – a beautiful fountain in the square outside the cathedral. This was built in the 16th century by one of Michelangelo’s students, Giovanni Angelo Montorsoli. 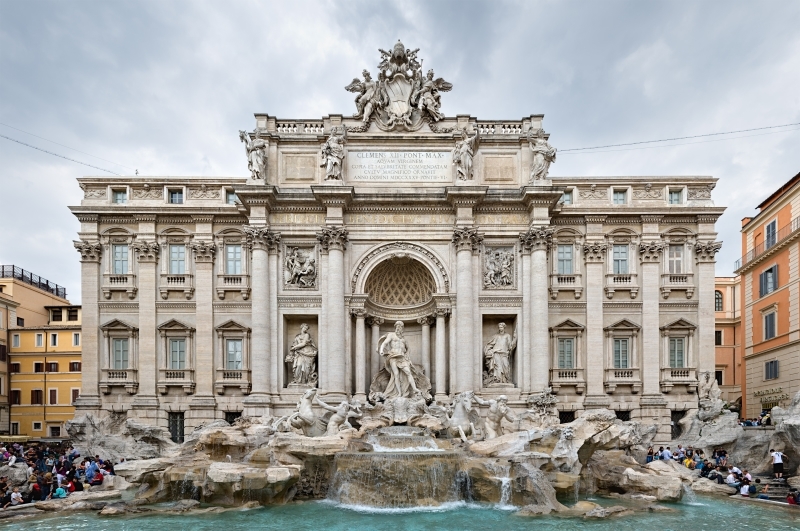 As well as being one of Italy’s most beautiful urban destinations, Rome is among its most historical and important. Its crowning glory is the Colosseum – once a stage for gladiatorial battles and other blood-soaked contemporary entertainment, this Roman amphitheatre is one of the city’s top tourist attractions. In its heyday, it could hold between 50,000 and 80,000 spectators. While it’s not in pristine condition, an incredible amount has survived given the fact that it’s around 2,000 years old – and exploring it today you can really get a feel for the impact it would have made back in Roman times. Another must-visit is the Vatican – the tiny independent walled state that has acted as the home for Catholic popes for centuries. The historical highlight here is the Basilica of St Peter, which has a beautiful 17th-century facade and impressive dome, and is one of the largest churches in the world. Athens is virtually synonymous with ancient history, and no visit here is complete without a trip to the mesmerising Acropolis. First, though, you might like to visit the Acropolis Museum, which was created back in 2009. Here, you can peruse the remarkable finds at the Acropolis site, including sculptural decorations of the Parthenon (you can also watch a really interesting video on this subject on the third floor). Of course, the real highlight is the Acropolis itself, which sits right in the heart of the modern city. Standing tall on Sacred Rock above the modern streets, the complex is home to world-famous buildings like the Parthenon and the Erechtheion. Of course, these are just a few of the top historical sites in Europe, but you have to start somewhere. Once you start exploring, it’s hard to stop … that’s the beauty of the travel bug! As the gloom of winter reaches its lowest point, it seems there aren’t many things around to bring energy into our lives. The cold rain, mist (and occasional snow) drain us of our motivations, and the early darkness of January is enough to make anybody question why one would live so far north at this time of year. Both you and your partner need a pick-me-up, and fast. Fortunately, you two have the perfect excuse to get the bloody hell out of town … Valentine’s Day! Since it is easy as pie to leave your car at short stay parking at Heathrow, a holiday of this nature is well within your reach, even if you don’t live directly within Central London. Over on the continent, there is no shortage of cities where one can get away at a moment’s notice. Not only do they prove that living in Europe has its advantages at any time of the year, but they also provide a deep bench of romantic destinations where you can have an intimate weekend with your adorable snugglebunny (or whatever pet name that you have for your love). Today, we will share three cities that are no-brainers for rekindling the spark in your relationship, no matter how dour the weather might be at home. Out of all the cities on our list, Paris is the metropolis that sticks out like a sore thumb, given that “the city of love” is one of its nicknames. There are many romantic attractions that will vie for your attention, but start your day in Montmartre, a district that is set on a hill, for some gasp-inducing views of Paris in all its ageless glory. Head to the Wall of “I Love You’s”, known in French as Le Mur Des Je T’Aime, to revel in the corniness of that famous phrase, written in 250 different languages. Finally, after a sensuous dinner at Laperouse, a restaurant set in an atmospheric 17th century mansion, go out for an evening of high society entertainment at Palais Garnier, a century-old opera house that was immortalized in Gaston’s Leroux’s seminal work, “The Phantom Of The Opera”. The Italians also give the French a run for their Euros in the romance Olympics with their ancient capital, Roma. After doing the mandatory hand-in-hand stroll past the Trevi Fountains, head up Aventine Hill to give your lover the surprise of a lifetime. At the top, there is a place referred to as the Aventine keyhole, an arch in the headquarters of the Priory of the Knights of Malta, where the dome of St. Peter’s Cathedral is perfectly framed between the ivy covered walls of that building. Afterwards, check out some exquisite art at Villa Farnesina and then attempt to re-create the infamous scene from Disney’s Lady And The Tramp, by getting some plates of pasta at Ristorante Pecorino, located at Via Galvani, 54, a wonderful place to have authentic Italian pasta. If you want to take your relationship to new places, then head to one of the hottest new places to get away for a romantic city break: Budapest, Hungary. Head to the Fisherman’s Bastion on the River Danube to get a sweeping view of this historic Central European gem, then check out its thermal baths, which are Budapest’s biggest claims to fame. After a relaxing soak among character-filled bath houses, go to the docks on the Danube, where river cruises are offered. With a glass of authentic Hungarian champagne each, toast each other for the red hot love that you still share with each other even after all these years. You may not have time for a proper holiday this winter, but that doesn’t mean you still can’t escape the city of a weekend of quality time with your loved one this Valentine’s Day. By taking advantage of your proximity to some of the most starkly beautiful metropolises on the planet, you will keep stoking the flames of passion that are key to a successful long-term relationship! Sometimes, the act of driving itself beats the anticipation of arriving at a final destination. There’s nothing better than those magical stretches of road, which seem to have been designed for fantastic driving. That’s why we’ve done our research, pooled our thoughts and created this guide to our favourite driving locations in Europe. So what are you waiting for? Grab your keys and head off in pursuit of some of the best driving routes the continent has to offer. Of course, this was the road used in the opening scenes of the classic 1969 film The Italian Job. It’s famous twists and turns have made it something of a bucket list item when it comes to European driving and it attracts travellers from all over the world. Take a look at this article from USA Today, for some great ideas about touring the Italian Alps using this majestic route, including things to see along the way. Spain is a country that just begs for a road trip. And with so many fantastic routes to choose from, you’re more than spoilt for choice. If you have two weeks to spare, nothing beats a comprehensive tour of Southern Spain and Andalucía. A great place to begin is Malaga, where you can pick up a rental car from the airport. Arrange this in advance to secure the best deal, using a company such as Economy Car Hire, which offers affordable car hire in Spain. Collecting a rental car is a much better option than driving your own car to the southern tip of Spain. By the time you get there, the novelty of driving may well have worn off and you’ll resent the amount of time you’ve already spent behind the wheel. Take a short flight and collect a car feeling happy and relaxed. This will make embarking on a trip to discover Spanish delights such as Nerja – heralded as the scuba diving capital of Spain – and the gorgeous beaches of Cabo de Gata, all the more enjoyable. It has to be one of the most popular routes in Germany, if not Europe: yet the iconic Route 500 through the Black Forest can often be deserted for enormous stretches, leaving just you and the road. Ultimate Driving has some great tips for driving on Route 500, including which parts of the route can get busy at different times of the day. A highlight along this route is the abundance of hot natural springs, which has resulted in a wealth of spas and health resorts springing up along the way. After clocking up some serious miles driving through Germany’s biggest nature reserve, we can’t think of a better way to relax than sitting in the bubbling waters of a natural thermal bath with a few German beers. Take in the gloriously clean air and indulge in some traditional German fare – as much as you love the driving experience, we’re sure you’ll find it difficult to drag yourself away from so much pampering! There you have it! 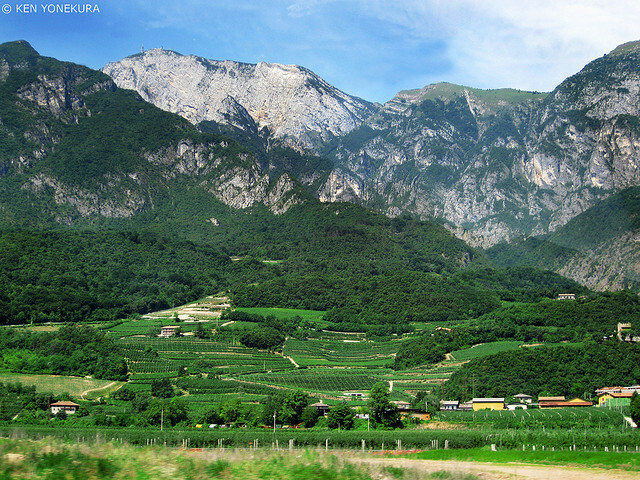 some of the best driving locations in Europe to enjoy your next road trip. The ‘Floating City’ is one of Europe’s must-visit cities and a trip to Venice can feel like a journey to a different, magical world. The city is made up of 118 little islands and has canals round every corner, making for a truly spectacular sight. Just over 250’000 people live there permanently and you’re perhaps just as likely to meet a tourist in the street as a local. Venice is a fascinating city with architecture, artwork and more and is considered one of the world’s most romantic cities. 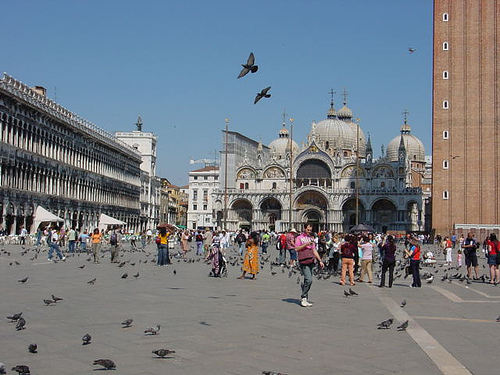 Saint Mark’s Square is the center point of Venice and is always packed full of tourists. The Campanile of the square stretches high into the sky, making it easy to spot from the surrounding areas. The current one was built in 1912 after the previous Campanile collapsed in 1902 and the views from the top of the 50 meter structure are some of the best you’ll find of Venice. Saint Mark’s Basilica is very much a part of the square with its western walls literally part of it. This great example of Byzantine architecture has over 4,000 square meters of ruby, emerald, diamond and gold covered mosaics and was built both as a tribute to Saint Mark’s body, as well as a way to demonstrate the great wealth and power of 11th century Venice. 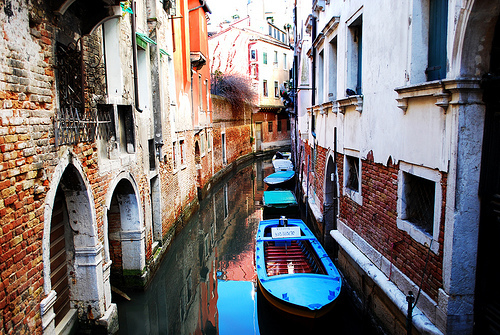 The other must-do activity in Venice is to take a trip on a gondola. These traditional Venetian boats cruise along the city’s canals every day and a ride at sunset can be a very romantic way to spend an evening in Venice, especially if you pass under the Bridge of Sighs where legend promises eternal love with a kiss. The first piece of advice for visiting Venice is to find a good map. And then buy a better one! The narrow and winding streets make the city of Venice a real-life labyrinth and you will almost certainly get lost at some point on your trip. The great thing is, however, that an afternoon lost in Venice is better than most afternoons anywhere else! You’ll find little passageways and sights that you’d never have found in the guidebook, making getting lost a lot of fun. Just make sure you have that good map, though, if you do want to ever find your back. The city of Venice can be quite expensive, but it doesn’t have to be! Don’t go for a meal near Saint Mark’s Square unless you’re happy to be a fortune for your food. Restaurants further from the center re generally cheaper which will make you and your wallet happy. You can also save money on accommodation by looking for a self-catering apartment instead of a hotel. GoWithOh.com is one site with apartments in Venice and worth checking out if you fancy that option. If you ever find yourself needing the toilet in Venice, know that cafés are obliged to let you use theirs for free. It’s always polite to stay for a drink if you do use their toilet, but a good piece of advice to know if you simply can’t wait! Hope you’ve enjoyed our quick Venice travel guide, and if you have any other special tips or cool things to see in Venice, please comment below!